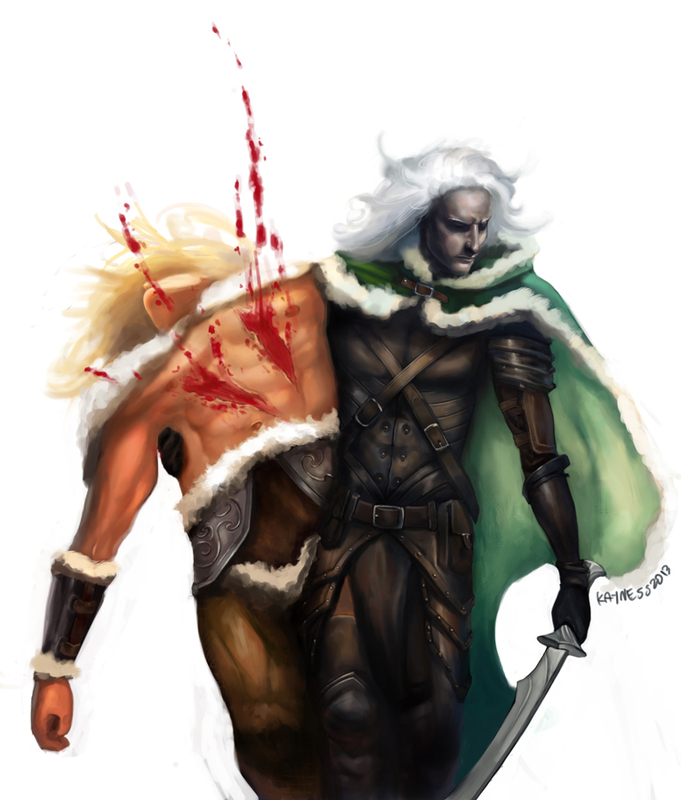 Kayness' Art Blog: Drizzt & Wulfgar: I'll catch you if you fall. Drizzt & Wulfgar: I'll catch you if you fall. This picture was swimming in my mind for a long time. I wanted to draw my hero from when I was a teen and everyone's favourite drow: Drizzt Do'Urden. I used to read every book featuring him from the beginning at Homeland, and stopped some years back at The Lone Drow so I'm rather behind right now, and I really was so enthralled by the books that I wanted to illustrate every scene, but for a long time I was not confident in my abilities to do it to a level that I can be satisfied with (and not to mention how much work that would be). This is supposed to be him with Wulfgar, catching the wounded Wulfgar as he falls. Great work, the armor design is particularly impressive.